We packed a lot in to the day already, having visited Caleta Buena, Playa Giron, and the Bahía de Cochinos, so we didn’t feel badly about not hitting the Hemingway Museum on our way back for our final night in Havana.. 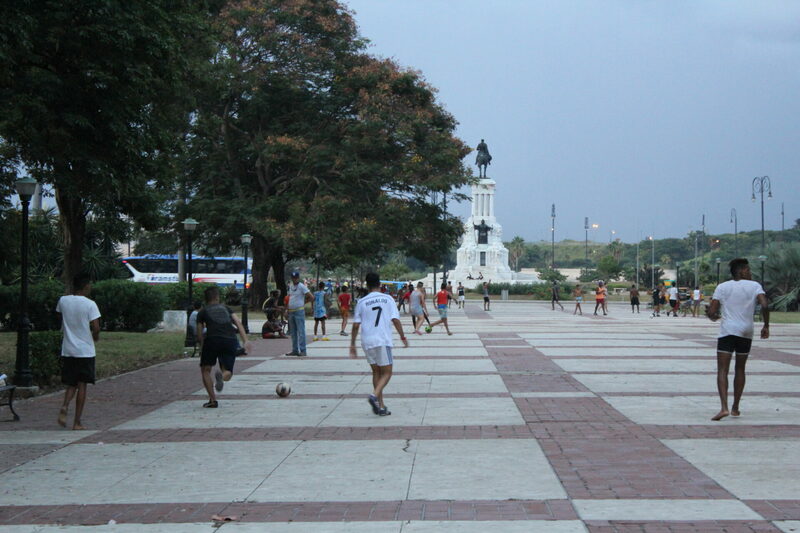 The benefit of not hitting the Hemingway museum was getting to Havana before dark. We would be staying again at Casa Castellòn, and felt comfortable enough to do some more sightseeing before we checked in. We parked the car with the attendant in front of the Museum of the Revolution for 1 CUC for 1 hour (he promised to “watch” the car), while we walked around to try to find art galleries in our never-ending quest for original Cuban artwork (everything seemed to be a copy of a copy of a copy, even though there were artist signatures on the canvases). We found several galleries around the fort to the Northside of the Old Town, but most were closed – so we decided to pack it in and return the next morning. We did decide to take walk around the Old Fort at the north side of the Old Town, and also saw this awesome street art on one of the walls outside. We drove the car to our Casa Particular, parked outside, and brought up our stuff. 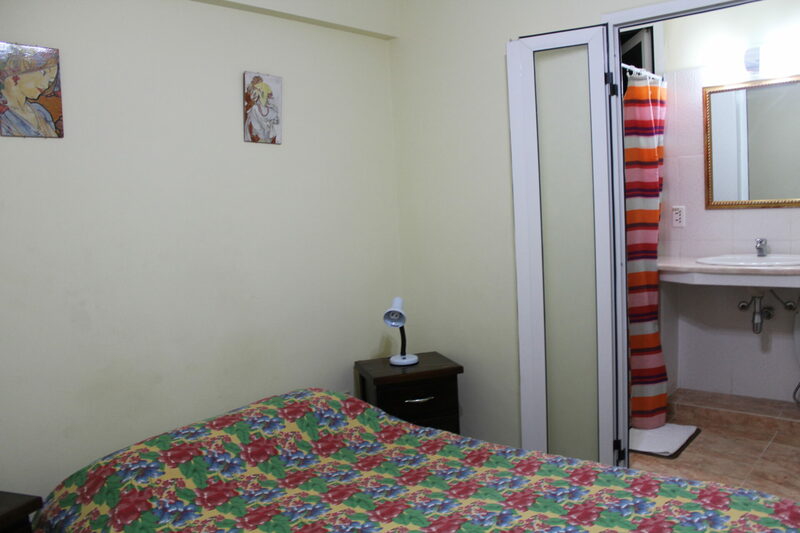 This time, we were in a different room – still comfortable, with A/C and hot water, but with slightly less space and no closet for storage. Kenia and her family again greeted us with friendliness and made us feel welcome again, like we had returned home after a long trip (which we kind of had). After dumping our stuff, Kenia advised us that we should move the car back to where we had parked it before, in the Museum of the Revolution parking lot where it would be safer overnight. The attendant initially wanted 10 CUC to leave it overnight, but we got it down to 4, and the attendant put a very official looking slip in our car to say that we could keep the car there until at least 2PM the next day. 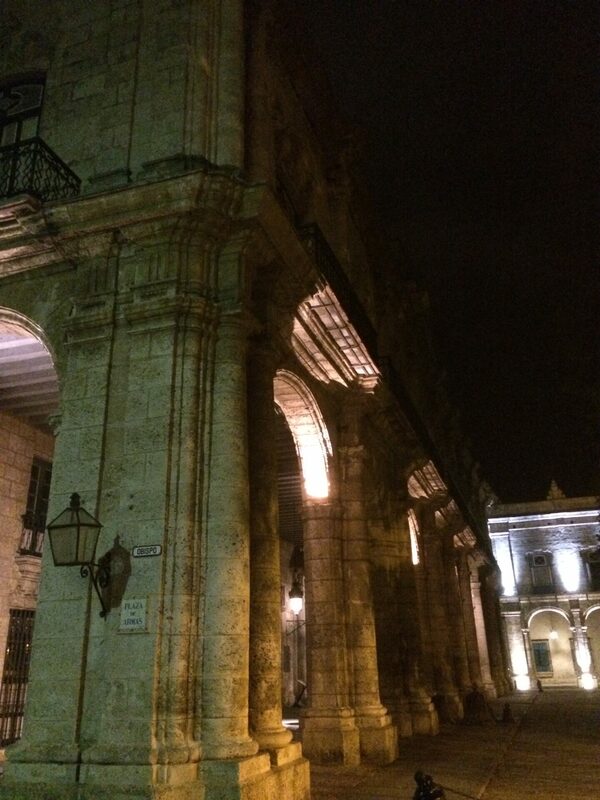 With our car now out of harm’s way, we took to the city for another night in Havana. 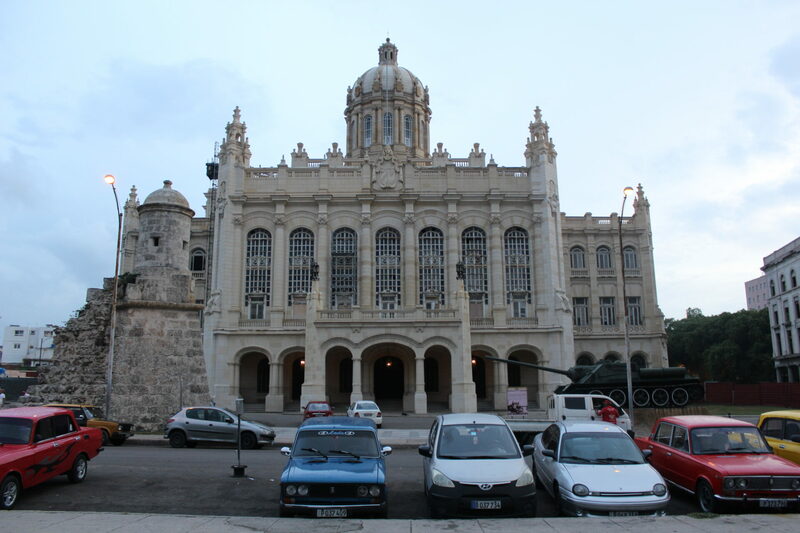 We had discussed going back to the street we went on the first night to try to hit up La Casa de Musica (the place we were initially turned away from because it was closing), but then decided that we hadn’t properly explored Habana Vieja so it was better to go there. I also had in mind that we should eat at one of the Paladars, which was kind of like a home restaurant (many of my friends had recommended to do this). We started out with a drink in a rooftop bar (this is starting to become our thing) at a small place next to the Archbishop’s residence, on the East side of Revolution Square near our hotel. The parking attendant had recommended it. It looked like a very nice place, even to eat at, but it was dead – only one other person was there (she actually looked like a local), and was sitting upstairs when we arrived. The theme of the restaurant again was manacles and chains, which reminded us of the place we ate at in Trinidad. This was apparently becoming a thing for us too. We left after one drink each of Olmeca Anejo tequila to continue our night in Havana. We stumbled in to some beautiful squares and old Spanish colonial buildings turned in to museums along our walk. 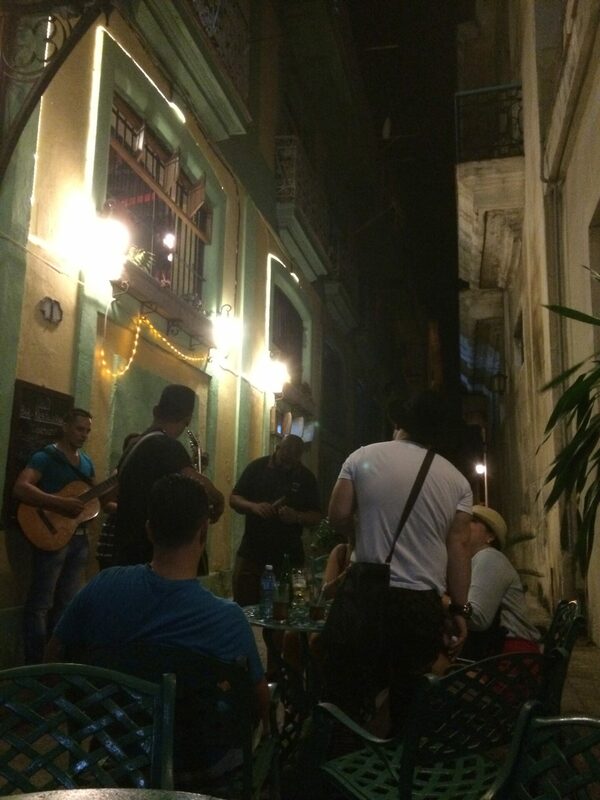 For a Wednesday night in Havana, the old city was hopping – tons of tourists but local joints too, many with Cuban music and bands. After being solicited gratuitously by several Paladar staff, trying to drag us in to their restaurants using all the tricks in the book, we had almost had enough – and just wanted a place that didn’t try to give us the hard sell. We decided to eat at Don Pucho – the woman standing outside asked us if we wanted a restaurant, and when we said no, she left us alone. Then we kind of looked at each other and said “Hey, we actually do want a restaurant.” We were hungry. So we went back up to her and she led us inside. A small quartet was playing (a little too loudly) and we eventually bought their CD. The dinner was reasonably priced, good, and filling. It included 2 drinks (we both had mojitos, but then ordered extra rum because they were lacking), a salad, any of the main courses (Dave ordered lobster and I ordered garlic shrimp), dessert (flan), and coffee. We thought everything was excellent, especially for the price and the atmosphere. I’d definitely recommend Don Pucho to anyone new in La Habana looking for a solid restaurant to fill one’s night in Havana. Our waitress was really flustered – either she was new or the loud Columbians were throwing her off – and she kept getting our drink orders wrong, bringing us the wrong tequila, or telling us things that were available that turned out not to be. Finally, after 30 minutes of goodbyes, the Columbians went inside the Paladar and continued to say goodbye. 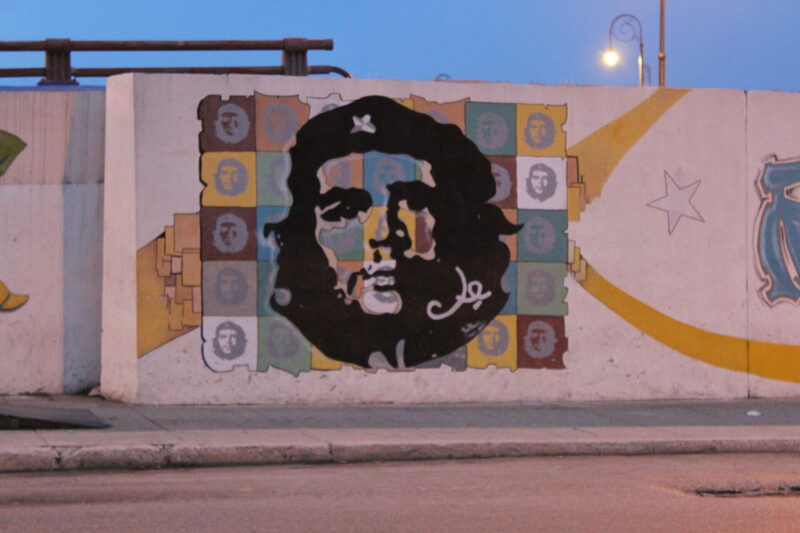 We made our exit, and headed back to our Casa after another successful night in Havana.